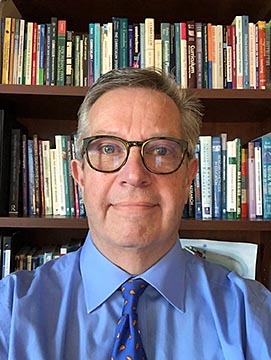 Dr. Robert A. Schultz of The University of Toledo Judith Herb College of Education has been named a Fellow of the American Council on Education (ACE) for 2019-20. The professor of gifted education and curriculum studies, and chair of early childhood, higher education and special education, is one of 39 to receive the distinguished designation. Established in 1965, the ACE Fellows Program is designed to strengthen institutions and leadership in American higher education by identifying and preparing faculty and staff for senior positions in college and university administration through its distinctive and intensive nominator-driven, cohort-based mentorship model. 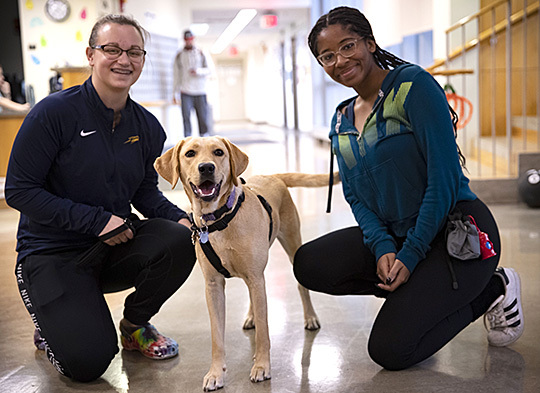 “I am honored to have been selected as an ACE Fellow and to serve The University of Toledo in this capacity,” Schultz said. “The program and training will provide a broad array of resources and experiences that are sure to be transformative in my growth and development as a leader. “I want to thank President [Sharon L.] Gaber for her support and encouragement to pursue this unique and prestigious opportunity,” Schultz added. Schultz has been a faculty member at the University since 2001. In addition to professor and chair, he serves as director of the Honors Program in the Judith Herb College of Education and is the assessment liaison for the University-wide Visual Literacy Consortium. He also is a member of The University of Toledo Leadership Institute class of 2018. He was nominated to be an ACE Fellow by a senior administrator at the University and completed a rigorous application process. The ACE Fellows Program combines retreats, interactive learning opportunities, visits to campuses, and other higher education-related organizations, and placement at another higher education institution to condense years of on-the-job experience and skills development into a single year. During the placement, Fellows observe and work with the president and other senior officers at their host institutions, attend decision-making meetings, and focus on issues of interest. Fellows also conduct projects of pressing concern for their home institutions and seek to implement their findings upon completion of the placement. At the conclusion of the year, Fellows return to their home institutions with new knowledge and skills that contribute to capacity-building efforts, along with a network of peers across the country and abroad. He is an alumnus of the University of Akron, where he received bachelor of arts and bachelor of science degrees in biology/chemistry and cytology, respectively, and a master of arts degree in education. Schultz also received master of art and doctoral degrees in gifted education and curriculum and instruction, respectively, from Kent State University. The Rocket Disc Golf club will travel to Appling, Ga., to compete in the National Collegiate Disc Golf Championships Wednesday, March 27. Club members will leave Tuesday, March 26, to arrive in time for the event, which will take place at the International Disc Golf Center. UToledo is one of 34 universities from across the country that will hit the course. Rocket Disc Golf qualified for nationals with a second-place finish at the Great Lakes Collegiate Open earlier this month at Deerfield Nature Park in Mount Pleasant, Mich. The team consists of Chelchowski, a senior majoring in sales and marketing; Wojciechowski, a Ph.D. student in measurement; Ryan Rau, a senior majoring in interdisciplinary studies with a focus in education and leadership; and Alex Phillips, a senior majoring in professional sales. After qualifying for nationals, the club had to figure out how to make the trip happen. Rau and Chelchowski went into fundraising overdrive and received more than $1,000 in less than one week via GoFundMe. Donations came in from UToledo alumi, family, and disc golfers from collegiate programs around the country. Students who want to get involved with the Rocket Disc Golf club can email Chelchowski at aaron.chelchowski@rockets.utoledo.edu or rocketdiscgolf@utoledo.edu. 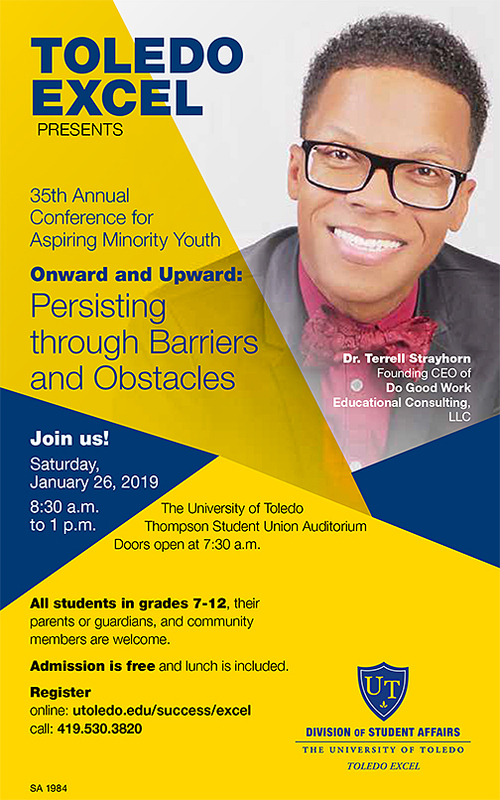 “Onward and Upward: Persisting Through Barriers and Obstacles” is the theme of The University of Toledo’s 35th annual Conference for Aspiring Minority Youth Saturday, Jan. 26. 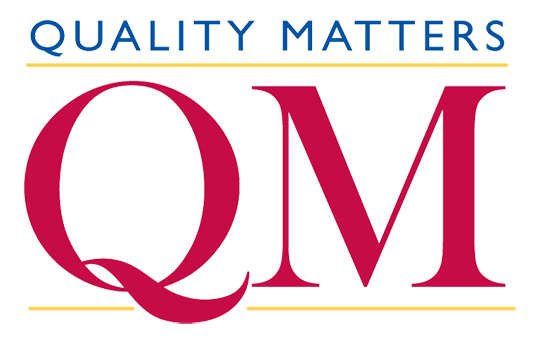 Sponsored by Toledo Excel and the UT Joint Committee, the conference for seventh- and eighth-graders, high school students and parents will start at 8:30 a.m. in the Thompson Student Union Auditorium. Dr. Terrell Strayhorn, a distinguished student success scholar, will give the keynote address. 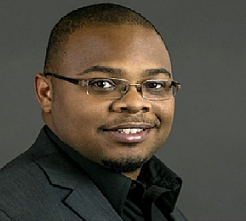 Strayhorn is the founding chief executive officer of Do Good Work Educational Consulting LLC, and professor of urban education and interim vice president of academic and student affairs at LeMoyne-Owen College in Memphis, Tenn. 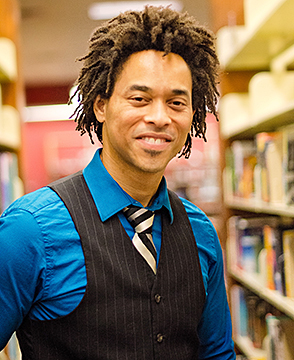 The authority on equity and diversity has written several books, including “College Students’ Sense of Belonging: A Key to Educational Success.” He is known for using the hashtag #DoGoodWork on social media. 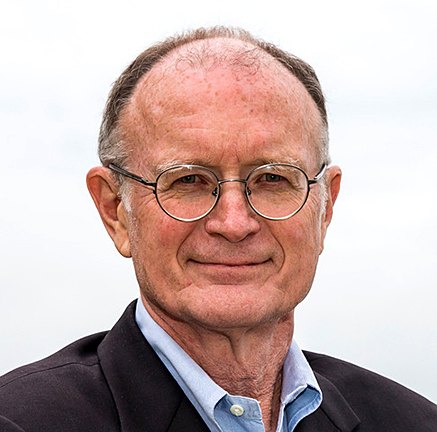 Scott received a bachelor of science degree and a master of education degree in education theory and social foundations from the University in 2014 and 2017, respectively. Toledo Excel was established in 1988 to help underrepresented students, including African, Asian, Hispanic and Native Americans, for success in college. Through summer institutes, academic retreat weekends, campus visits and guidance through the admission process, students increase their self-esteem, cultural awareness and civic involvement. Toledo Excel is part of the Office of Multicultural Student Success, which is in the Division of Student Affairs. The UT Joint Committee includes representatives from the University, Toledo Public and Parochial schools, and civic and community leaders from the city of Toledo. The mission of the committee is to bring together people in the community interested in the education of underrepresented youth. The UT Joint Committee also serves as an advisory board and support system for Toledo Excel. Advance reservations for the free, public conference are encouraged; visit the Toledo Excel website or call 419.530.3820. Last year, 21 faculty from across the University participated in the second year of the UT Leadership Institute. The program was launched in fall 2016 by UT President Sharon L. Gaber and Provost Andrew Hsu to provide professional development to help prepare future academic leaders. • Dr. Puneet Sindhwani, Urology, College of Medicine and Life Sciences. 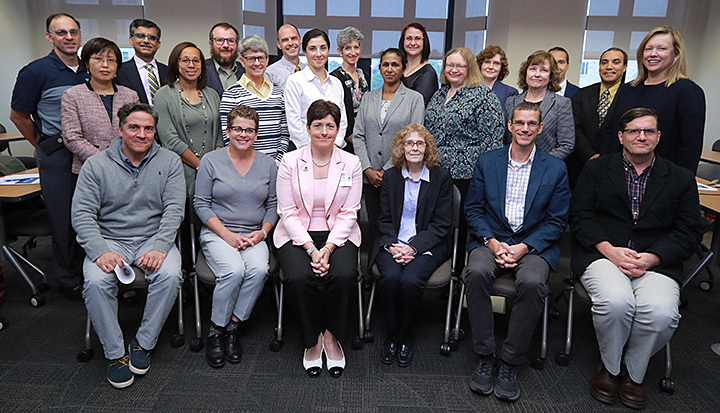 The first meeting of this year’s UT Leadership Institute cohort was held Oct. 5 and will be followed by monthly meetings throughout the academic year. Participants will discuss various aspects of leadership in higher education and engage in discussions with members of the UT leadership team and invited speakers, with presentations focusing on leadership styles, critical issues facing administrators, funding, and diversity and inclusion. President Sharon L. Gaber, second row standing at right, posed for a photo with most of the members of the 2018-19 class of the UT Leadership Institute during last month. He will sign his debut book Saturday, Nov. 17, from 3 to 5 p.m. at Intersection Church, 1640 S. Coy Road in Oregon, Ohio. Entertainment, giveaways and refreshments will be provided at the event, where the book will be for sale for $8.99. Proceeds will go to Celebrate Recovery, which is a program for anyone struggling with hurt, pain or addiction of any kind. Holloway wanted his first book to inspire others. 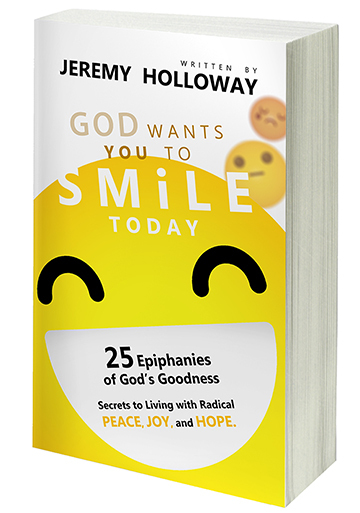 “‘God Wants You To Smile Today’ is an inspirational book about using your talents and lives to put a smile on the face of our Creator, and on the faces of others around you,” he said. Holloway is using his talents to help many. He is a mentor for undergraduate students through the University’s Brothers on the Rise, which helps UT males, especially African-American and Latino, make the transition from high school and college. 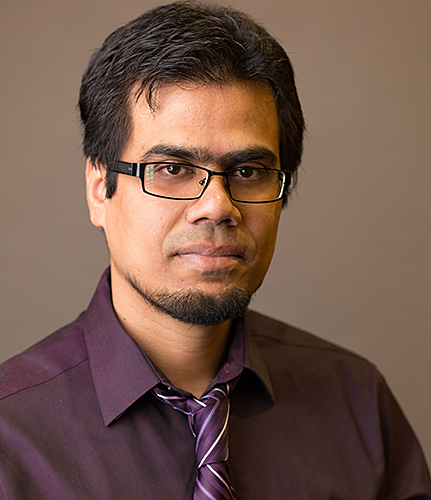 He also is involved with UT’s Multicultural Emerging Scholars Program, represents the Judith Herb College of Education in the Graduate Student Association, and is a leader for the Kappa Delta Pi Honor Society in Education. In addition, he is a mentor with Big Brothers Big Sisters. His work and dedication have been noticed. In 2017, he received the 20 Under 40 Leadership Award, which is presented annually by Leadership Toledo to 20 individuals who are 39 or younger in the Toledo community who have demonstrated exceptional leadership qualities. The native of Toledo received a bachelor of arts degree in Spanish and a bachelor of education degree from UT in 2005. He taught Spanish at area schools and graduated from the University in 2014 with a master’s degree in English as a second language. “The opportunities I’ve received at UT have surely made me smile, and I consider them to be a gift that I intend to share to make other people smile as well,” Holloway said. In the future, he intends to write academic books to engage the mind, but he also plans to write inspirational books to engage the soul, heart and spirit. “God Wants You to Smile Today” will be for sale at the Nov. 17 event and also is available at Amazon.com in paperback and Kindle form. The books were distributed to 40 second-grade classrooms at 21 TPS schools. 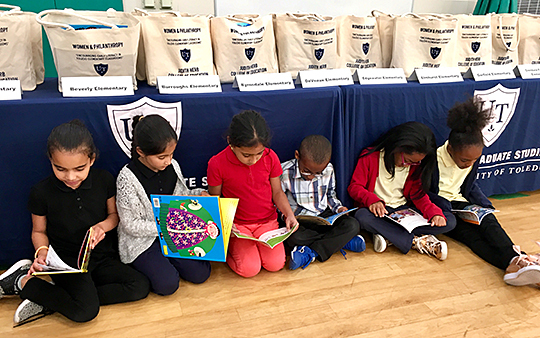 Second-grade students at Old Orchard Elementary School were excited to receive new books from Women & Philanthropy at The University of Toledo and the UT Judith Herb College of Education. Marcy McMahon, the chair of Women & Philanthropy, and Dr. Romules Durant, TPS superintendent, presented the books to representatives from each school Oct. 18 at Old Orchard Elementary School. This is the second year that fundraising for the Encouraging Early Literacy Holiday Project allowed Women & Philanthropy and the Judith Herb College of Education to donate more than 1,000 new books to TPS second-grade classrooms. Last year, the organizations donated approximately 1,000 books to 33 second-grade classrooms at 19 TPS schools. This year’s donation covers the remaining classrooms and completes the goal of donating books to start a library in every second-grade classroom at TPS.